No, dolphins are not your 'therapists.' So just stop it. Though it might not fit with New Age dolphin lore, the reality is that dolphins, even those born in captivity, are wild. There's absolutely no evidence to support the burgeoning practice of dolphin-assisted therapy. Here's why dolphins are not healers — and why this practice needs to stop. 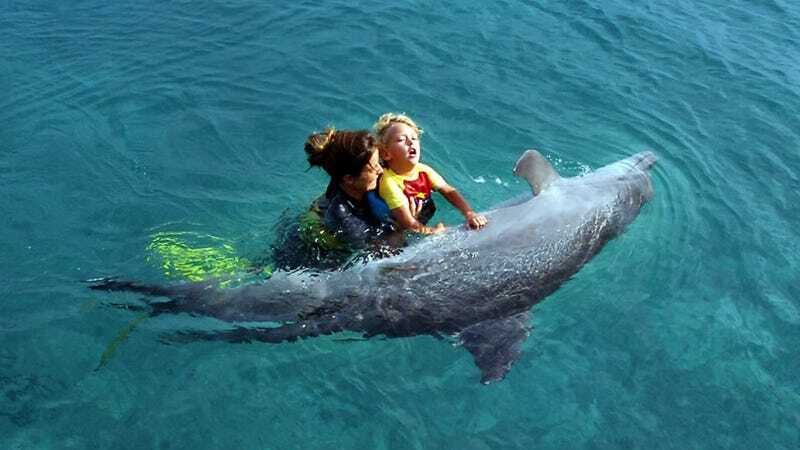 Top image: An autistic child swims with a dolphin. Photo by Andrew Bosch/MCT/Getty. Dolphin-assisted births? Yeah, let&apos;s not go there. Jay's parents, who had given up hope, are elated to have finally found a treatment that works for their son. They sign up for more sessions and cannot wait to get home and tell their friends about the experience. They are not surprised to find that dolphins have succeeded where mainstream physicians have not. Everyone believes that dolphins are special — altruistic, extra gentle with children, good-natured. And any concerns the parents might have had about the welfare of the dolphins have been allayed by assurances from the trainers that they are happy and accustomed to the role they are playing. After all, as the parents can see for themselves, the dolphins are smiling. DAT took off in earnest when Lilly’s early explorations became better known through the efforts of the educational anthropologist Betsy Smith, then at Florida International University. In 1971, Smith let her mentally disabled brother wade into the water with two adolescent dolphins. She noted that the dolphins treated him tenderly: she believed that they knew her brother was disabled and were attempting to soothe him. Soon after, Smith established therapy programmes at two facilities in Florida, and offered them free of charge for many years. But she later concluded that DAT programmes were ineffective and exploitative of both the dolphins and the human patients, and in 2003 she publicly denounced them, calling them ‘cynical and deceptive’. Image: WDCS International. DAT facilities will often post testimonials from enthusiastic parents on their websites, some of which are recorded just minutes after the session ended, when parents are feeling most hopeful. These websites attract other parents who are desperate to find cures for their own children. They come away impressed with the ‘evidence’ that DAT can improve their children's lives, and the apparently scientific approach of the staff. It all looks so promising, and so they figure it’s worth the plane fares, the time off work, and the high price tag. This article originally appeared at Aeon Magazine.